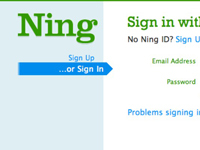 1Sign in to your Ning account by clicking the Sign In link at the top of the Ning.com home page. When you do so, you’re prompted to sign in with your Ning ID — the e-mail address and password you used when you signed up. 2Fill in the Name Your Social Network text box. You can change this name later, so don’t worry too much if you misspell it or change your mind about it. 3Enter a Web address in the Pick a Web Address text box. The characters you enter are appended in front of .ning.com and turn into your network’s Web address. For example, if you enter networkfordummies (without spaces), your network’s address becomes http://networkfordummies.ning.com. 4Click the Create button and wait for a few seconds. 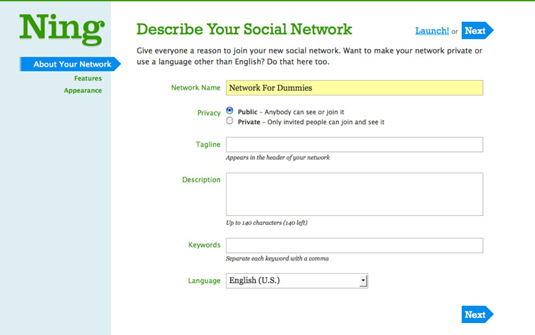 The Describe Your Social Network page opens. At this point, your network is still not available to others. 5Change the network name, if you want. You have the opportunity to change the name you chose in Step 2 when you created the network. If you don’t want to touch it now, you can still change it later through the Manage section of your network. You have two options: Public – Anybody Can See or Join It; and Private – Only Invited People Can Join and See It. 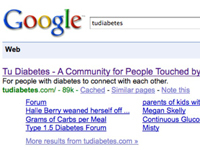 A tagline is the text that appears in the header of your network. 8Add a description of your network. 9In case your network’s name, tagline, and description don’t contain some keyword that you want to have associated with your network, enter some keyword terms, separated by commas. 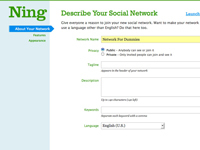 Including relevant keywords makes it easier for people to find your network when they’re searching on Ning.com. 10From the Language drop-down list, select a different language for the interface of your network, if the default English (U.S.) isn’t the best option for your members. From Polish to languages you may never have even heard of, you can offer your network in more than 20 languages, and new ones are being added frequently. Your Ning network is up and running!